Having been good theme park tourists and getting to bed before 1am on the night of our arrival, my travel partner and I woke up early the next day ready to hit the theme parks. 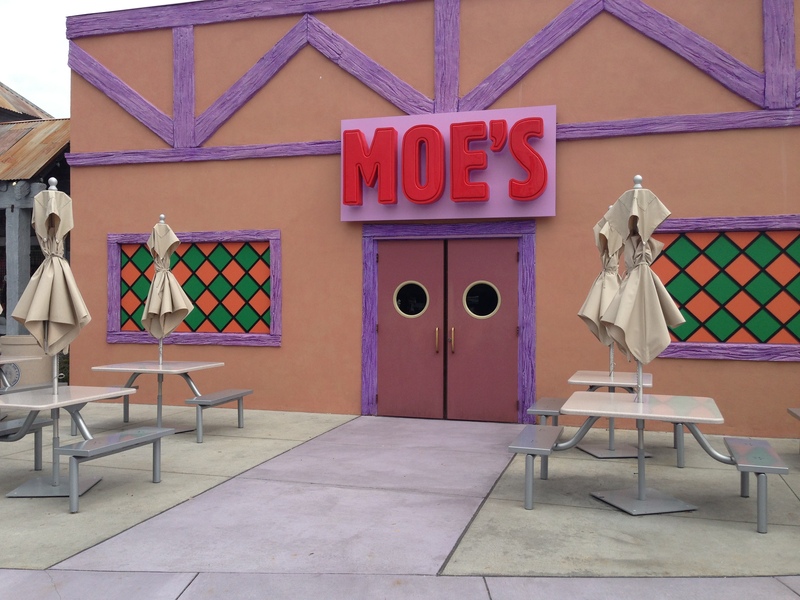 Universal offers early entry to the Universal Studios park to guests staying on site. 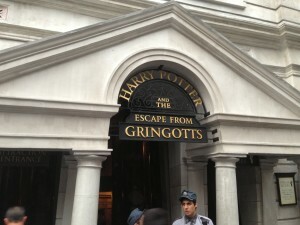 This offers a fantastic chance to see Diagon Alley prior to heavy crowds and long wait times hit the attractions in the area. 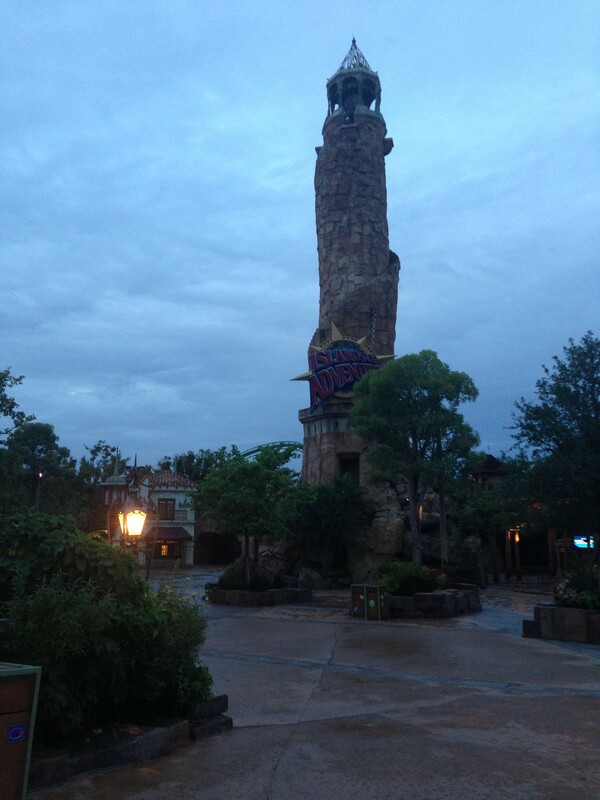 With this knowledge in mind we packed up and headed out…to Islands of Adventure. I am still not sure why we walked to the wrong park! My only excuse was that we chose to walk (very easy) from the resort and IOA is closer to Royal Pacific than Universal Studios. 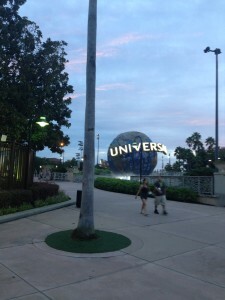 Once we realized our mistake we ran to Universal and made it in plenty of time. Now here is a very important tip. 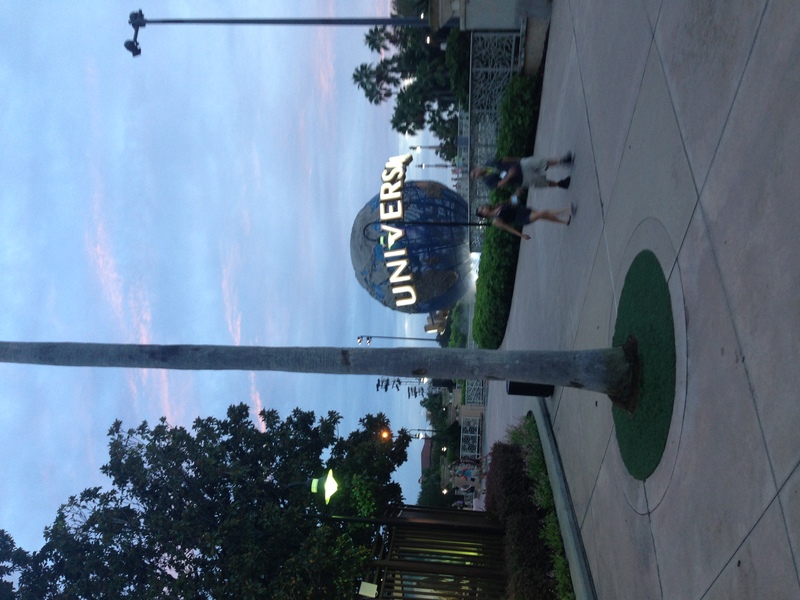 I usually just visit Universal as a day guest and as a travel agent I work very hard to ensure my clients do not make any mistakes or have any hassles on their trips. One thing I always remind them of is that Universal is not Disney. Your room key is not your key to the world card. Though you can charge things to your room, your key is not your park pass or dining plan. It is simply a key. You have to pick up your tickets at your hotel ticket desk. This is clearly outlined in your package when you book, but often it is hard to remember to do this for a Disney vet. It also does not help that the check in staff doesn’t really remind you to visit the ticket desk. So, needless to say we arrived at the park, swiped our room keys and were promptly denied entrance! It was a rookie mistake and one simply remedied at guest services, but annoying none the less! 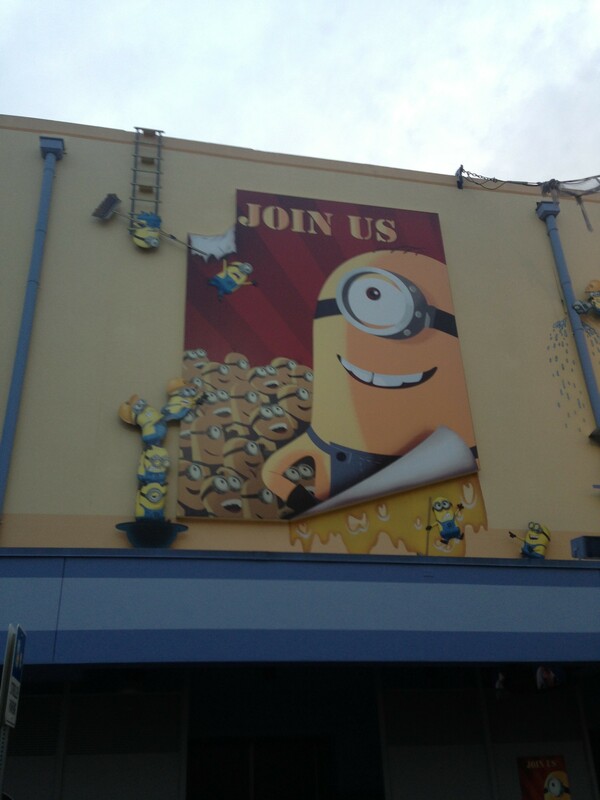 I think Universal needs to do two things here. 1. They need to train their staff to ask guests at check in if they have tickets or a meal plan and then direct them to the appropriate area to retrieve these items. 2. They need to make your key card your access card a la Disney. As a guest I was carrying a park ticket, a room key, my credit cards, and an express pass. That is a lot of superfluous items. Anyhow, having left ample time we got into the park and headed to Diagon Alley. 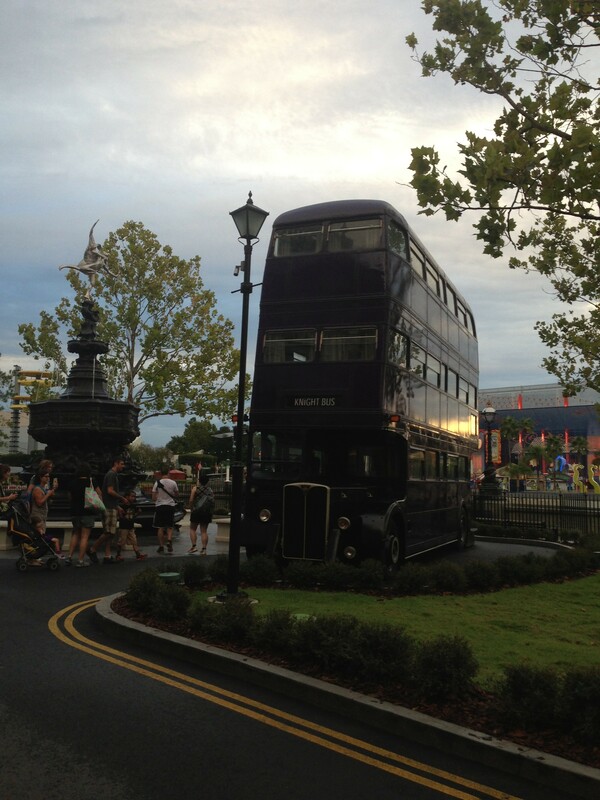 The only clue you have that you are approaching Diagon Alley is a few British flags, a plain looking train station, a brick wall and the legendary Knight Bus. There are not big signs or cast members telling you where to go. Was this off putting…not in the least! It is part of the story! 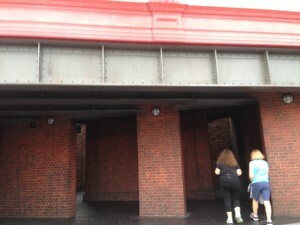 Diagon Alley is a well hidden area. It is for wizards only! Once you slip behind the brick wall you are transported into another world in a way that no theme park has quite yet achieved. Follow the little streets through the shops, peer into the windows, listen to the sounds. You are in a different world. If you take a wrong turn you will end up on knockturn alley, the dark and devious side street where black magic may be taking place. The crown jewel of the area is Harry Potter and the Escape from Gringotts. The bank is at the end of the street and topped with a fire breathing Dragon. 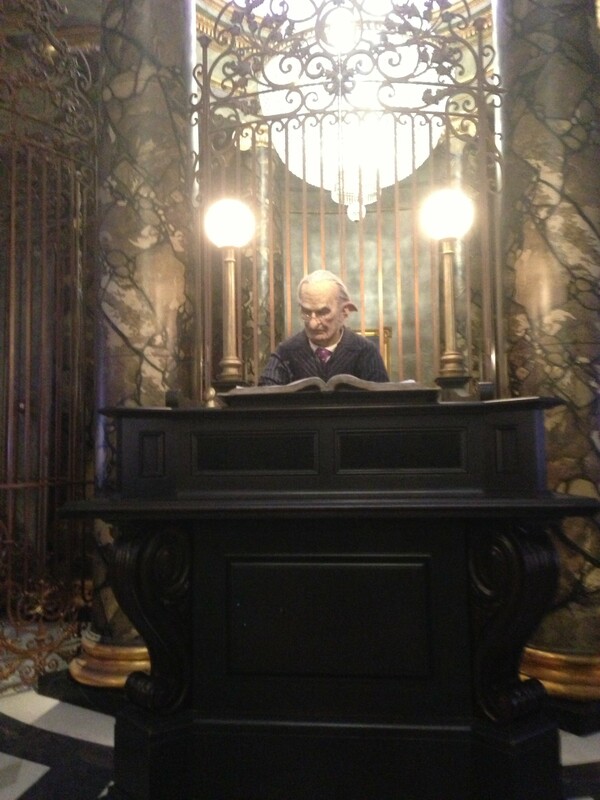 Enter through the bank where goblin tellers look so real you swear they are breathing. Head down the elevator to the center of the earth and into your ride vehicle to visit your vault. This ride is a 3D almost roller coaster, real life movie, totally all encompassing experience. This ride is a must do. 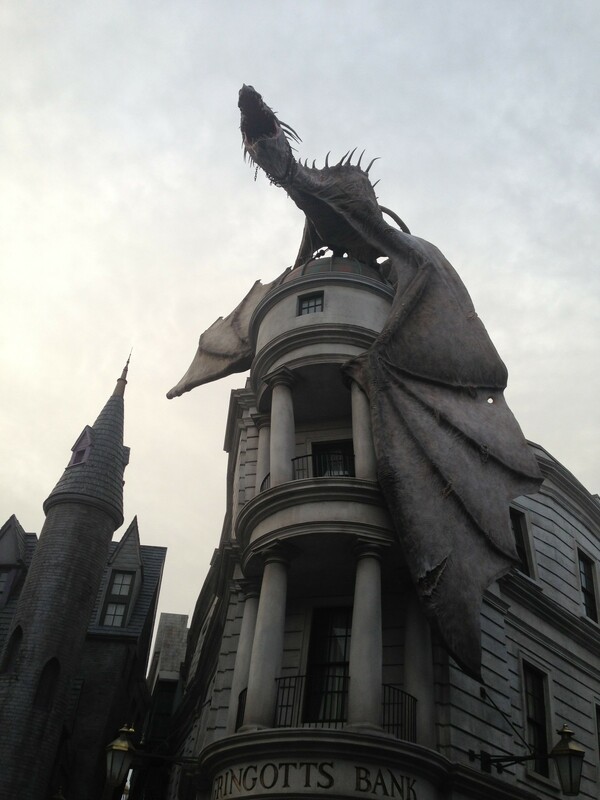 As a resort guest you have to take advantage of the extra hour in the park to ride this attraction without a wait, but Universal Express is not available on this attraction or Harry Potty and the Forbidden Journey at Island of Adventure. 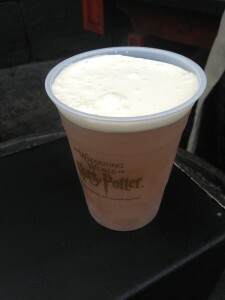 After riding the attraction, peeking around the area and of course drinking a butter beer, we head to platform 9 and 3/4! 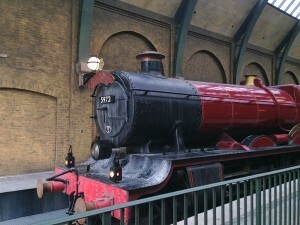 Walking into the train station you will feel as though you are in any train station until you see people go through the wall to get to the Hogwarts Express. You watch what seems like guests in front of you head to a solid wall and then like magic, go through the wall! Amazing! We headed into our cabin, which is directly out of the movie, and took our seats. Then the magic began. 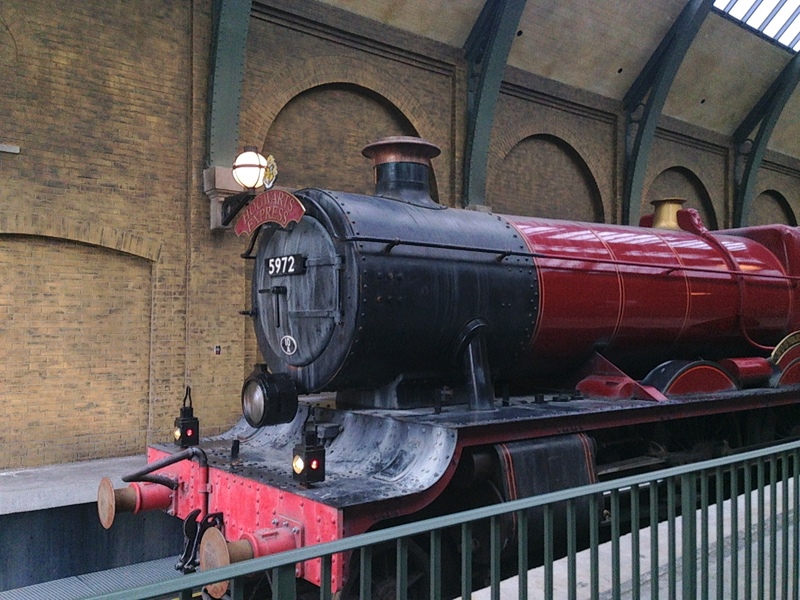 The scenes we passed were incredible but what was happening in the corridors of the train was even more amazing! Death eaters, Harry and his gang, the treat trolley…they all passed by! This is no ordinary mode of transportation. This is an attraction. The only hang up is if you want to ride you need a park to park ticket. Definitely worth it. 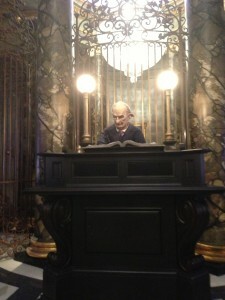 We were dropped off in Hogsmeade and did some shopping. I have ridden Forbidden Journey before and it does not agree with my stomach so we skipped that and headed to do some other rides. We rode cat in the hat, Jurassic Park (My Favorite), Blutos Bilge Rat Barges, and Dudley Do Right and were soaking wet. The water rides at Universal are serious. We decided to head back and change. Our room is about 10-15 minutes from any point in the park! We headed back and got changed. The afternoon brought rides on Spiderman, Transformers, and minion mayhem. I love all of these rides, especially transformers. They are very fun and very incredible experiences. 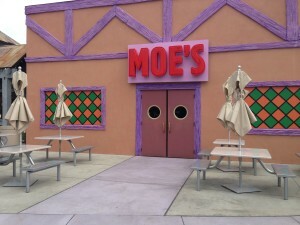 We also saw Shrek 4D, visited Springfield and the home of the Simpsons. It was a fantastic day until the rain came and washed us out. Oh well, we ended up having dinner at the resort. Jakes American Bar in Royal Pacific is a great place for a casual bite. We got the homemade pretzel rods to start and these were spectacular. So spectacular in fact I had to look back at my photos to see what my entree was. I ordered the peach bbq rotisserie chicken which was good but not memorable, clearly. Then for dessert we got the churro bread pudding. Let me say that again. Churro. Bread. Pudding. Wow! The meal was excellent and the service was incredible. A would highly suggest this restaurant to hotel guests as it is a great break from the Asian inspired meals found at the other eateries in the hotel. All in all it was a fantastic, albeit wet, day at the park! Keep reading on over the next few days as I take you from Universal to Walt Disney World and then aboard the Disney Wonder to set sail for Halloween on the high seas! 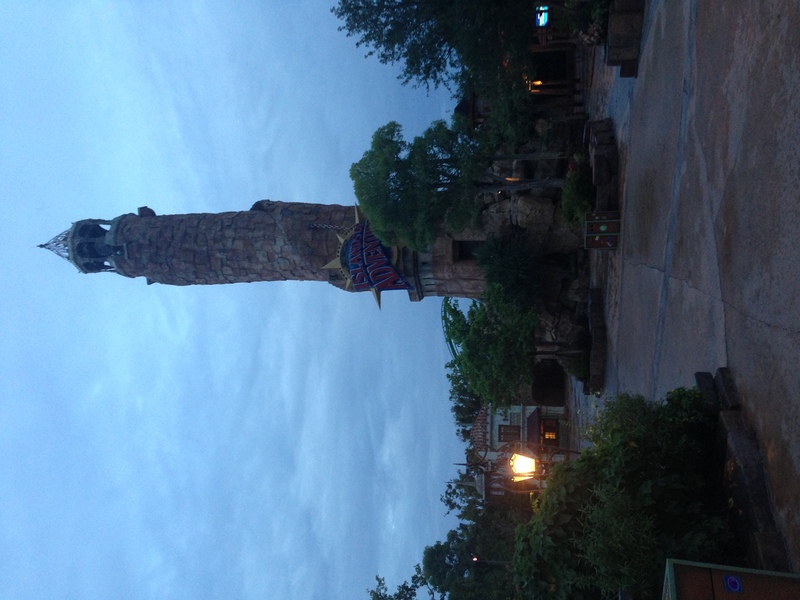 This entry was posted in My thoughts, Planning Tips, Trip Report, Uncategorized, Universal Orlando. Bookmark the permalink.